The BEST museum is hidden inside Anik Depot in Sion, and is a well-curated museum displaying the history of transport service in India since before the British era. Getting to the museum in itself is a task, and that has to do with nothing the fact that it’s slightly out of way owing to its location in near the Easter Expressway in Sion. It is housed out of the third floor of the depot and the old, weathered building doesn’t have any elevator. After climbing the three flights of stairs we got to the museum and are confronted by a humble opening letting us know this is where the transport heritage spot is. Though for its unlikely location, the museum is actually run out of a spacious place with natural light that keeps filtering in through the rusted grilled bars. This is where we met Mr Sanjay Chaulker, the museum guide who’s been working there for over 16 years now. For the next one hour, we submit ourselves to Mr Chaulker who gave us a guided tour of the museum, with facts and interesting anecdotes about the BMC employees. The museum really is a gold mine when it comes to getting to know the transport history. 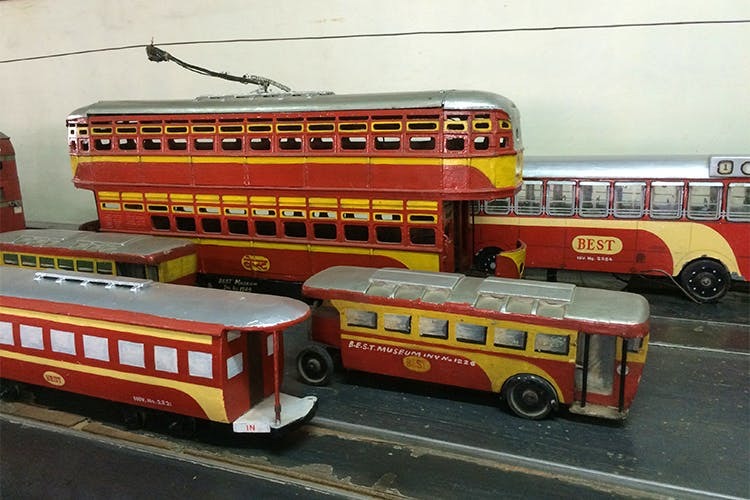 From horse-driven carriages and trams, to the earliest models of single and double decker BEST buses, it displays it all. We came across the ‘junction traffic assistance’ a dome-like structure that were used before the traffic signals were invented. As we walked around, we re-discovered the unusual but essential history of the transport industry in Mumbai. Here are a list of thing we spotted: old, faded tickets of trams and buses worth four annas, companies that made the buses up until the Tata’s stepped in, an original bus engine, 3D models of the buses, a bell that was dug up from the Wadala bus depot and an 18th century wooden grandfather’s clock that runs with the help of a weight pulley. The museum easily transported us to an era that we all probably have read in our school’s history books. It’s a wonder to walk visually through the museum and picturising the time that once existed. The old artifacts and framed photographs make for a fascinating lazy stroll. Mr Sanjay told us there is a huge possibility of the museum shifting its base to somewhere in SoBo, preferably Colaba. However, it all depends if the funding comes through in time.